The Rowan tree, also known as Mountain Ash, is a sacred tree for all earth religions. An old folk name for Rowen is quicken, thus February is also known as the quickening moon, apt for a month in which we celebrate women’s mysteries. As a druids’ tree, it was among the holiest trees in the Celtic forest. Its elemental association is fire and the tree is thought to have protective qualities. The tree is associated with the Celtic goddess Brigid, who is honored at this time. Other plants associated with the Sabbat are crocuses and snowdrops. These early spring flowers are among the first to peek from under the snow. In the language of flowers, the crocus symbolizes a person with a youthful heart, no matter their age, and hints as freshness, love, and romance. A crocus’s elemental association is water. Snowdrops are known as milk-flowers and symbolizes hope, renewal, and consolation. The snowdrop’s elemental association is earth. If you haven’t already taken down the wreaths, swags, and pine boughs used for yuletide decorations, do it now. A sprig from those left-over boughs makes a perfect addition to represent the element air on your altar and removing yuletide decorations will help to welcome the coming spring. In the language of flowers, pine symbolizes endurance, friendship, loyalty, and long life. The tree is considered masculine and helps balance all other feminine energies of the holiday. Blackberries are associated with Brigid, and thus are suitable for the simple feast on Imbolg. Their elemental association is water and are thought to correspond with healing, prosperity, and protection. Because milk and dairy products feature heavily on this Sabbat, a blackberry cheesecake is sure to be a crowd pleaser. 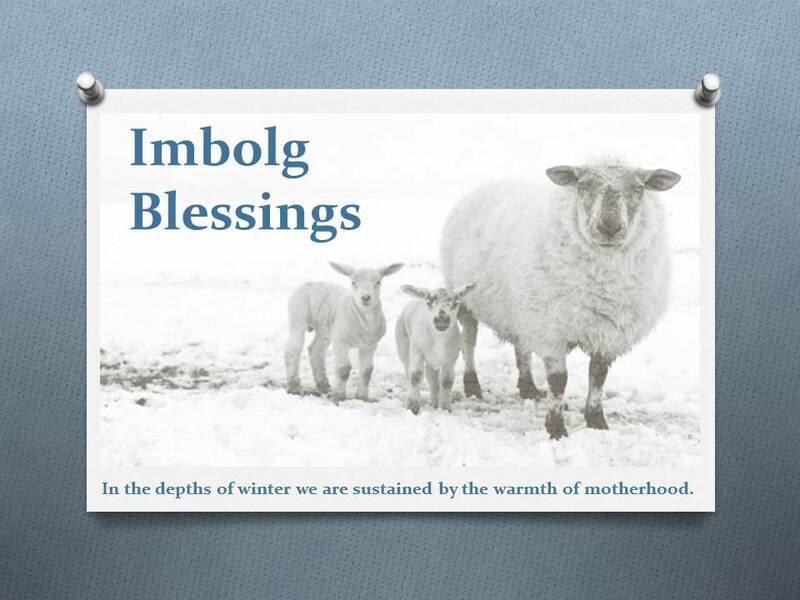 I wish you great blessings this Imbolg. Merry meet, merry part, and merry meet again.